This smoke Presidio Camera Strap from ONA holds a camera and lens combination weighing up to six pounds and is meant to be worn across your body. 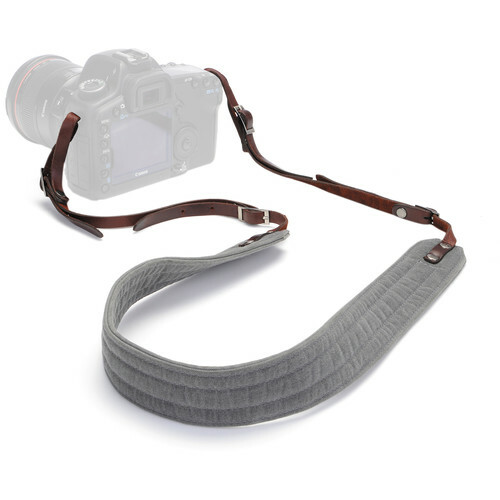 The Presidio Camera Strap is 63" long and features top-grain leather connector belts that can be adjusted from 19.5" to 23.5". This handcrafted strap, has a neoprene padded waxed canvas neckline for comfort, and chrome hardware accents. To maintain the wax finish of your canvas strap use optional re-proofing wax. Box Dimensions (LxWxH) 14.0 x 5.6 x 1.6"
Presidio Camera Strap (Smoke, Waxed Canvas/Leather) is rated 4.0 out of 5 by 1. Rated 4 out of 5 by Juleann V. from A classy strap This is the perfect camera strap for me -- and for anyone who doesn't like to use brand straps with bold print advertising around your neck. It is a long strap, so probably not good for people who are vertically challenged. If you like wearing your camera strap cross-body it is comfortable and secure. I have not experienced any problems keeping the leather buckles from scratching my camera screen.